The folks at the U.S. Fish and Wildlife Service can help you with some of those questions with its online Feather Atlas, a compendium of flight feathers from 348 North American species, with new species added regularly. You can search by bird species or by taxonomic groups (owls, woodpeckers, etc.). But if you want to identify an unknown feather, use their Identify Feather finder and follow the steps. 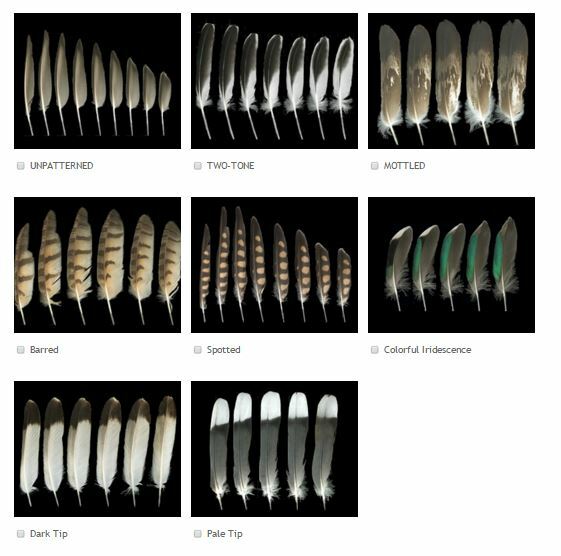 A tool will help you classify your feather by color, pattern and other characteristics before it runs a search for possible feather matches. HELPING SORT IT ALL OUT – Easy steps will have you identify your feather in no time. Once you have identified your feather, however, think twice about taking it home. The possession of feather – or any parts of birds – without a permit is prohibited by law. And yes, there is no exception to feathers lost naturally via molting, or from a bird that was killed on the road or elsewhere. Nature has to stay where nature be. There are a few exceptions – legally-hunted waterfowl and migratory game birds. Native Americans also have permission to use feathers. In any event, just take snaps of your find and put it back for the next lucky discoverer.